Quantitative Easing is the concept of the Fed becoming a buyer of Treasuries and Bonds to try and stimulate the economy. The Fed does Quantitative Easing when they are hoping to (1) create inflation and avoid a deflationary economy, (2) lower the unemployment rate, and (3) boost Stock prices. 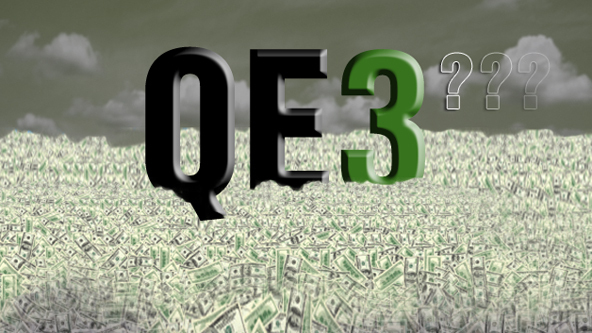 Why did the Fed announce QE3? With our economy still struggling (especially our housing and job markets), QE3 was inevitable. But what caught the markets by surprise was the aggressiveness of the Fed’s action. Over the next several months, at the very least the Fed will be buying Mortgage Bonds at an annual rate of nearly $800 Billion. What does QE3 mean for home loan rates? The Fed is buying such large amounts of Mortgage Bonds each month to keep home loan rates (which are tied to Mortgage Bonds) near record lows, which they hope will help strengthen our housing market and economy overall. However, as the economy starts to improve and if inflation heats up, Bonds could face some selling pressure…which could impact home loan rates negatively as a result. What Impact Will It Have On Home Sales? Keeping interest rates low will definitely help. However, we are not sure it will be a driving force in a housing recovery. Rates are already at historic lows and the challenge to many buyers is availability of mortgage money more than it is the cost of that money (rate). Keeping rates low can’t hurt the market and perhaps it will encourage some move-up buyers to make the move now. But few believe it will spur a dramatic increase in home sales.